This beautiful villa with 5 bedrooms and 5 baths, bathrooms located on a large plot on the eastern plateau. Surrounded by greenery, beautiful gardens and offer beautiful views of the golf course and mountains. Convenient access and a garage for tw..
Beautiful spacious villa with 3 bedrooms and 3 baths rooms located on the eastern plateau of Aphrodite Hills. On the ground floor is a large living room and kitchen/dining area with French windows leading to a large terrace and swimming pool and a..
Beautiful spacious villa with 3 bedrooms, 3 bath rooms is located on the eastern plateau of Aphrodite Hills. On the ground floor is a large living room and kitchen / dining area with French windows leading to a large terrace and pool area; to the .. Spacious villa with 3 bedrooms is furnished to a high standard, situated in landscaped gardens with private heated pool and stunning views of the picturesque valley and the Mediterranean Sea views from the roof terrace. .. Exclusive Villa with a superb five-bedroom, with a large private heated swimming pool with overflow, creating a sense of infinity, several terraces with sea views and the golf course, located in a quiet environment - is one of the largest in the c..
Three bedroom villa is in a dead end on the eastern plateau of 3 spacious bedrooms, 4 bathrooms and panoramic views of the sea. 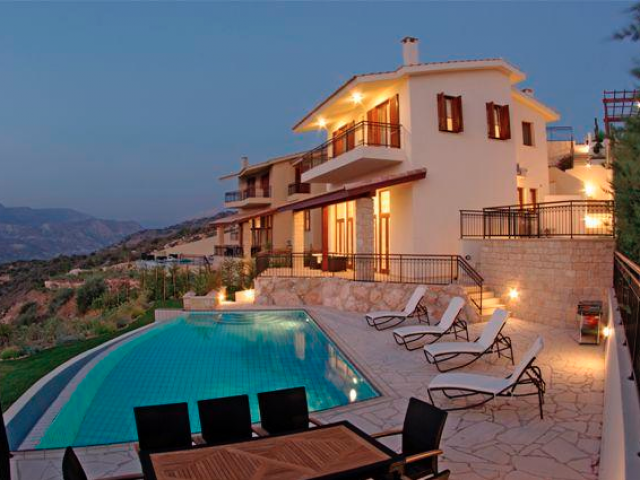 This magnificent villa is situated on three levels, with a spacious living area and high ceilings. On the ground floor .. Unique villa, the only one of its kind in this resort, built on a double plot and located in such a way that offers spectacular panoramic views of the surrounding countryside from every room. This spacious villa with four large bedrooms, three bat.. 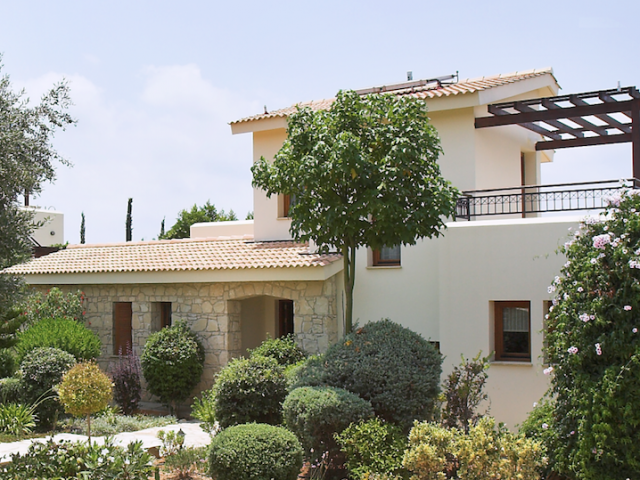 Luxury property potential in Cyprus offered by Exclusive Aphrodite Hills, Cyprus. Great position, private and luxurious, all within a short 10 minute walk from the villa to the centre of the resort facilities on the Western plateau. 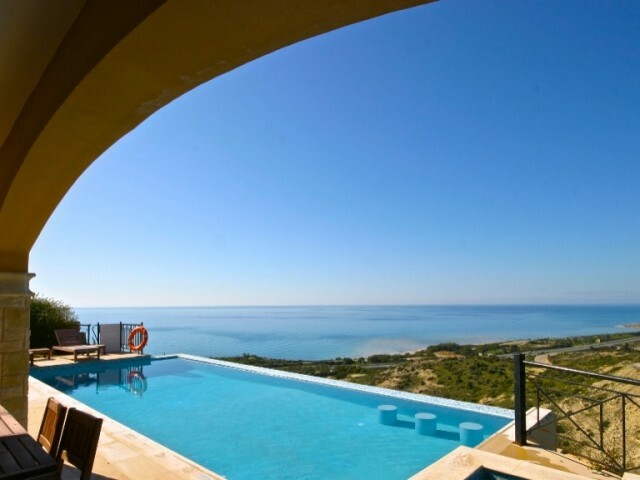 A well designe..
Three bedroom bungalow on the eastern plateau of Aphrodite Hills offers luxury privacy and tranquility. The bungalow is situated on a large plot of land in a quiet location. Bungalow is surrounded by greenery, beautiful gardens and offer beautiful..
Qualitatively built with thoughtful design stylish villa with 5 bedrooms, 5 bathrooms, located on the western plateau and has a breathtaking view of the sea and the valley. The villa is situated on a large plot of land, surrounded by green space, ..